To use your iPhone to listen to music, just tap the Music icon on the Home screen. Then, at the bottom of the screen that appears, you should see five icons: For You, New, Radio, Connect, and My Music. If Apple Music is disabled in the Settings app, you only see four icons; For You is exclusively for Apple Music users. If you don’t see these icons, tap the back icon in the upper-left corner of the screen (the one that looks like a little arrow pointing to the left). If you’re used to the previous version of the Music app, you’re surely wondering where your songs, playlists, artists, and everything else went. Don’t worry; everything has been moved to the My Music tab. You need to know about the new Apple Music and the not-so-new iTunes Match subscription services, because almost everything in the Music app works differently if you subscribe to one or both. Now, let’s take a quick look at the other all-new tabs in the all-new Music app: For You, New, Radio, and Connect. These tabs offer music that’s not yours (at least not yet), which is to say music that’s not in your iTunes library. Apple Music subscribers can listen to (almost) any song, album, or playlist that they discover in these four tabs; nonsubscribers can purchase (almost) any song, album, or playlist they discover. For You: Many would say the first tab — For You — is the best thing about the new Music app. Here you’ll find music that iTunes thinks you’ll enjoy: playlists, albums, artists, and songs that (mostly) aren’t part of your iTunes library. Remember, you see this tab only if Show Apple Music is enabled in Settings → Music. New: Here you’ll find the latest releases, plus song and album charts for dozens of musical genres as well as curated playlists featuring new songs and artists. Radio: If you’ve ever listened to the radio, you will grok the Radio tab immediately. Connect: This tab offers news and gossip direct from artists you choose to “follow” (by tapping the Follow button on their artist page). Or tap the See Who You’re Following link near the top of the page to enable Automatically Follow Artists (when you add their songs to your music library). The For You, New, and Connect tabs operate in the same fashion; each is a long page filled with content. Scroll down to see more, and then tap any item to see additional information. Tap the + icon to add this song, album, or playlist to My Music (available only to Apple Music subscribers). Tap the heart icon to tell iTunes you love this artist, song, album, or playlist, which helps the For You tab suggest music it thinks you’ll enjoy. Tap the ellipsis icon to see additional options, which may include Play Next, Add to Up Next, Add to a Playlist, create Genius Playlist, Make Available Offline, and Show in iTunes Store. Tap the Play icon to listen to this song, album, or playlist. To get started, tap the Music icon on your Home screen and then tap the Radio icon at the bottom of the screen. The first thing you see at the top of the screen is Beats 1, Apple’s new live radio station. It’s on the air worldwide 24 hours a day, 7 days a week, with world-class programming, interviews, and music. To listen, tap the Listen Now button. If you have one of the new iPhone 6s models, you can save a few steps by pressing the Music icon and choosing Play Beats 1 from the Quick Actions list that appears. Recently Played: These are stations that — you guessed it — you’ve played recently. Tap one to listen to it now. Featured Stations: This handful of stations has been hand-picked for your enjoyment by the nice folks at Apple. Tap one to listen to it. 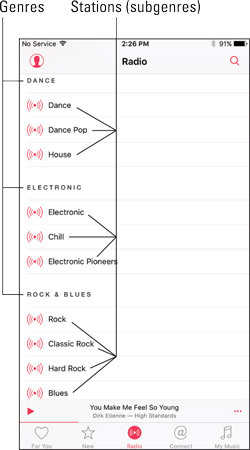 Genres: These stations are organized by genre, with stations as subgenres. Tap a subgenre to listen to it. Scroll down past Recently Played and Featured Stations to find stations organized by genre. iTunes Radio is available on your iPhone, iPad, iPod touch, Mac, PC, and Apple TV for free? You’ll hear the occasional ad, or you can listen without ads if you subscribe to iTunes Match. So that’s how you find a station and start listening to it. When a station is playing, the name of the current song appears near the bottom of the screen; tap it for additional options. 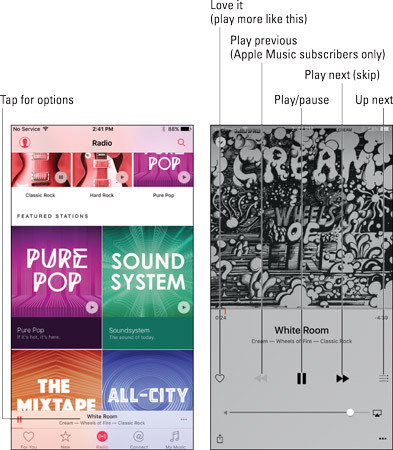 Tap the song’s name (left) to see additional options (right). If you want stations to play more songs you’ll like, tap the heart icon to the left of the play/pause icon whenever a song you love is playing. The more you do this the better the suggestions in the For You tab will be. And that, friends, is pretty much all you need to know to use and enjoy radio stations in the Music app.